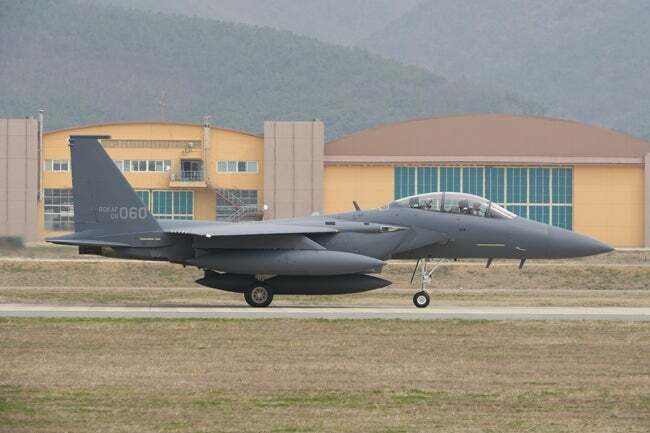 The Republic of Korea Air Force (ROKAF) has taken delivery of the final two F-15K Slam Eagles jet fighters from Boeing at Daegu Air Base in South Korea. The delivery forms part of the next fighter II contract, awarded in April 2008 for additional delivery of 21 F-15K fighters to ROKAF, and takes the Air Force fleet to 60 aircraft. Boeing F-15 programme vice president Roger Besancenez said the company has worked with the ROKAF to ensure that their F-15Ks included all the capability and power necessary to defend their homeland through 2040 and beyond. The company will continue its support for ROKAF fleet under five-year $300m long-term affordable Performance Based Logistics (PBL) sustainment contract received from the Republic of Korea’s Defense Acquisition Program Administration in February 2012. Under the contract, Boeing will ensure long-term, affordable sustainment of F-15Ks, allowing them to remain operationally ready to protect the nation, in cooperation with Hyundai Glovis, which is providing in-country logistics and supply chain distribution. Boeing also noted that local industries such as Doosan DST provided embedded GPS inertial navigation systems and Hanwha provided hydraulic and flight control actuators. Huneed Technologies contributed wire harnesses, wings and forward fuselages were provided by Korea Aerospace Industries, LIG Nex 1 supplied networking and avionics technology, while Samsung Thales provided electronic counter-measure and radar warning receiver gear. The F-15K Slam Eagles are advanced variants of the F-15E, and features a new electronic warfare suite including IEWS ALR-56C (V)1 radar warner IDS ALE-47 countermeasures dispenser system and ALQ-135M radar jammer. The Tiger Eyes sensor suite includes mid-wave staring array FLIR, laser and CCD TV, terrain following radar and mid-wave staring array FLIR and long-range infrared search and track (IRST). ROKAF chose the F-15K as its next-generation fighter and placed orders for 40 aircraft in April 2002, with the first fighter entering operational service in July 2008. Image: The ROKAF F-15K Slam Eagles jet fighter stationed at Daegu Air Base, South Korea. Photo: Boeing.